As Anglian sponsor NCFCs Man of the Match, we can bring you each home game report straight to the blog! 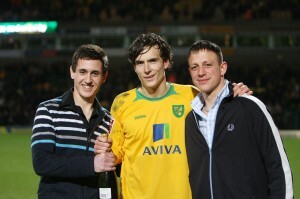 Read on for details of the Man of the Match presentation for the NCFC vs. Cardiff City game on 10th March. “On-loan forward Alan Gow picked up his first Anglian Man of the Match award of his Norwich City career as the Canaries clipped the Bluebirds promotion-chasing wings and earned three valuable points on Tuesday evening at Carrow Road. When interviewed by Jeremy Goss in the Gunn Club at the post-match presentations Alan spoke about the importance of the game and the importance of the team winning their remaining games. “Everyone knew we had to get a result tonight and it was great to get what we deserved,” he said. Despite City’s ongoing battle against relegation, Alan was keen to emphasize that he was really enjoying his time in Norfolk and he also acknowledged the part the Norwich fans played in recent victories.